You wake up in the morning and you swallow....ouch! Throat infections are one of the most common ailments we are likely to suffer during our lives but that does not make them any less painful and disruptive. Infections of the throat can be caused by both bacterial and viral invaders and are more common in children, who often have weaker immune systems and come into physical contact with others more. Septic Throat - This is the name given to a sore throat that is a result of a bacterial infection. Most bacterial throat infections are caused by streptococcus bacteria. A streptococcus infection is highly contagious, meaning it can spread easily between people. This type of infection seems to be more common in children over four, and tends to come on very quickly. Symptoms include high temperature, red and swollen tonsils with white blotches and tender, swollen lymph nodes at the side of the neck. Laryngitis - This is an inflammation of the voice box which in turn causes a sore throat and hoarse voice. Laryngitis can affect people for short or long periods of time. Acute laryngitis is usually due to a viral infection and often occurs at the same time as a cold. If symptoms persist for over a week, it is recommended to see a doctor. Tonsillitis - Most of us will know someone that has had their tonsils removed. These two small masses of lymphoid tissue in the throat are part of the immune system and act as the body's first line of defence against infections. Tonsillitis is an inflammation of the tonsils and symptoms include pain and difficulty in swallowing. In most cases of tonsillitis white spots will appear on and around the affected area. Tonsillitis is most common in children, but it can occur at any age and often requires antibiotics to aid in healing. If you suffer from repeated attacks over many years it may be decided to remove the tonsils. (It is questionable, though, as to whether this is a good solution in the long-run as your tonsils are a part of your immune system). 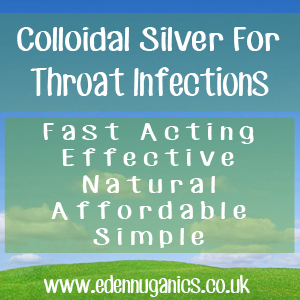 One of the most powerful natural remedies in the treatment of any form of throat infection is colloidal silver. For those of you that have not yet come across this versatile healing liquid, colloidal silver is a simple solution of distilled water with suspended particles of microscopic silver. Its discovery was viewed by many people as being as important as the discovery of penicillin. This powerful, non-toxic, natural antibiotic is effective against bacteria, viruses and fungi. It is able to protect the human body from various infections and stimulate new cell growth. It can be used orally, sub-lingually or topically on the skin. The best method of using colloidal silver in the treatment of throat infections is with the use of a fine mist achieved by using a spray bottle. Simply open your mouth and apply two short sprays of colloidal silver around 8 times a day while suffering from the infection. This will help to speed recovery and is harmless when swallowed. You can also gargle with 'as hot-as-you-can-bare' (pre-boiled) water with a teaspoon of colloidal silver added. Salt-water - A great tip for instant relief from a sore throat is simply gargling with salt-water. Salt works like an antiseptic by helping to draw water out of mucous membranes in the throat. This helps to reduce phlegm and inflammation. Mix around a teaspoon of salt in a glass of 'hot-as-you-can-bare' (pre-boiled) water. A small amount of honey can be added to avoid the salty taste if you like (honey also has antibacterial properties, especially Manuka honey). Gargle with the solution for 30 seconds. Do not swallow it. Spit the water out after gargling. Repeat this until the glass is empty. Lemon - Lemons are another great tool for relieving a stubborn sore throat, they help remove mucus and the natural acids help to kill bacteria. Try hot lemonade with honey. Mix the juice from half a lemon and one teaspoon of honey in one cup of hot (pre-boiled) water. Sip it slowly. Another option is to gargle with freshly pressed lemon juice diluted with an equal amount of hot water. Apple Cider Vinegar - It seems there are very few common ailments in life that apple cider vinegar can not be used to treat. Its powerful antibacterial and antiviral properties make it one of the most popular remedies in the treatment of any kind of throat based infection. Boil some water and add a spoonful of honey and around two tablespoons of raw, unfiltered apple cider vinegar. This can be drunk twice a day, first thing in the morning and just before bed seems to be most effective. You can also make a gargle solution with apple cider vinegar. Mix one teaspoon of salt and one tablespoon of apple cider vinegar in one cup of boiled water. Gargle with it several times a day for faster results. Tonsillitis and Staph Infection After Operation.